sculpture commissioned by Coco and Buddy, two alumni of the German Shepherd Rescue of Orange County. Specially created for GSROC, this stunning art piece is a unique opportunity for anyone who loves and/or has lost a cherished animal companion to create a lasting tribute to them, whether a dog, cat, bird or horse. 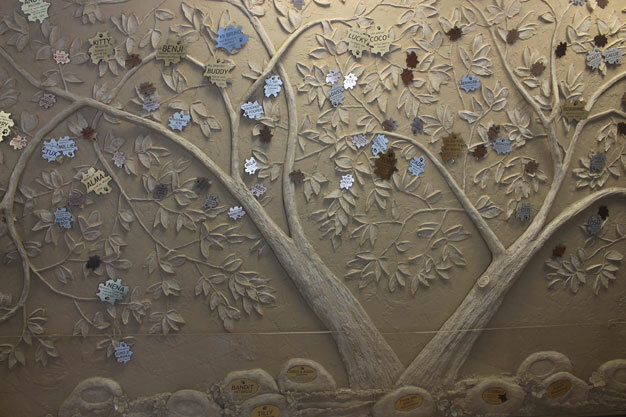 Donate any amount in support of the trunk and branches or order a personalized leaf or stone inscribed with your own message. Leaves come in different sizes and colors and will be placed on the Tree of Love. The number of leaves and stones are limited. This beautiful 7’ x 20’ sculpture is on display at Country Care Pet Resort, 4691 Valley View Ave in Yorba Linda, California during normal business hours. 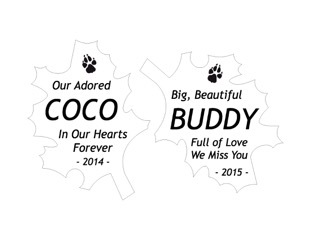 Please join us in adorning this Tree of Love with the permanent remembrance of your companion pet. Donations help us provide food, shelter and medical care to our rescued friends. 1. By Mail. 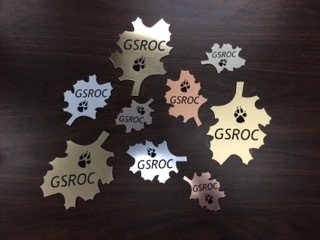 Please click on this link to download the pdf file and fill out your information and the engraving information. Send it to GSROC on the address listed on the pdf file along with your check made payable to GSROC – Tree of Love. 2. Through PayPal/Credit Card. Click here to be redirected to our PayPal interface for the Tree of Love. Thank you for your support. Your donations are tax-deductible to the extent allowed by law. For questions, please contact volunteer April Morris by clicking here.